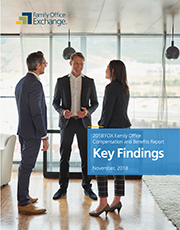 The 2018 Family Office Compensation and Benefits Report is designed to aid family office board members and executives in their review of the office’s compensation plan. The report highlights the key areas of family office compensation and benefits while providing you with invaluable perspective on your office’s plan relative to your peers. The Key Findings paper provides some key insights into this year's report. More comprehensive results and analysis are only available to FOX Members. You can learn more about membership here.